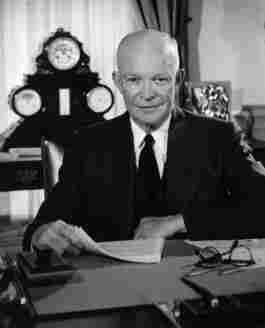 Eisenhower's Warning Still Challenges A Nation Just days before President Dwight D. Eisenhower left office in 1961, he gave the speech that coined the phrase, "the military-industrial complex." It was his warning to the nation, and some say it's a lesson America should heed. 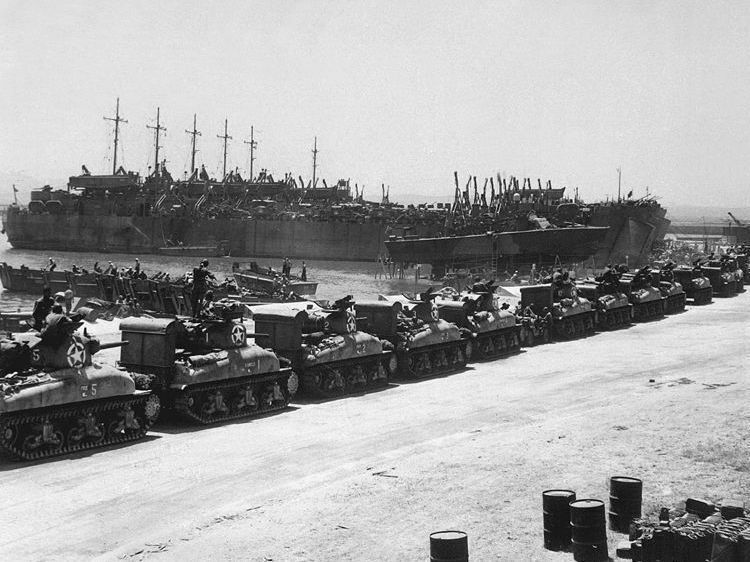 Tanks line up to board landing ships at the French Naval Base in Tunisia, July 1943. Before President Reagan urged Soviet leader Mikhail Gorbachev to "tear down this wall," and even before President Kennedy told Americans to ask "what you can do for your country," President Dwight D. Eisenhower coined his own phrase about "the military-industrial complex." That statement, spoken just days before Eisenhower left office in 1961, was his warning to the nation. At the time, the United States was sitting atop a huge military establishment built from its participation in three major wars. This buildup led Eisenhower to caution against the misplacement of power and influence of the military. Fifty years later, the United States is engaged in two wars abroad, and some say Eisenhower's warning still holds true. While some historians have written off Eisenhower's farewell address as an afterthought, his grandson, David Eisenhower, says it was a speech the president spent months crafting. "He did know it was going to have an impact," David Eisenhower tells Weekend All Things Considered host Guy Raz. David Eisenhower is the director of the Institute for Public Service at the Annenberg School of Communication and co-authored the book Going Home To Glory: A Memoir of Life with Dwight D. Eisenhower. Part 1 of Eisenhower's farewell address on Jan. 17, 1961. 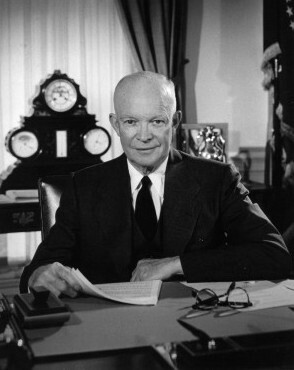 Part 2 of Eisenhower's farewell address on Jan. 17, 1961. It was Eisenhower's somber words about the military that caught peoples' attention. "In the councils of government, we must guard against the acquisition of unwarranted influence, whether sought or unsought, by the military-industrial complex," he said in his farewell address. "The potential for the disastrous rise of misplaced power exists and will persist." Eisenhower's warning was all the more powerful coming from a five-star general. "The feeling among Eisenhower's allies was that Eisenhower had said something that in one way or another would undermine the position of many political allies that he had," David Eisenhower says. Those allies worried that Eisenhower's words would be used against them, particularly as the Vietnam War began. Had the president handed antiwar activists a slogan they could use to oppose the conflict? David Eisenhower contends his grandfather was not concerned with the political fallout. "I have immersed myself professionally for many years in the Eisenhower papers," he says. "I know how his mind worked. I know what his habits of expression were. This is Dwight Eisenhower in the farewell address, and he speaks the truth." Though most people remember Eisenhower's speech for its warning about the growing influence of the Pentagon, David Eisenhower says the president had another message. "Eisenhower's farewell address, in the final analysis, is about internal threats posed by vested interests to the democratic process," he says. "But above all, it is addressed to citizens -- and about citizenship." 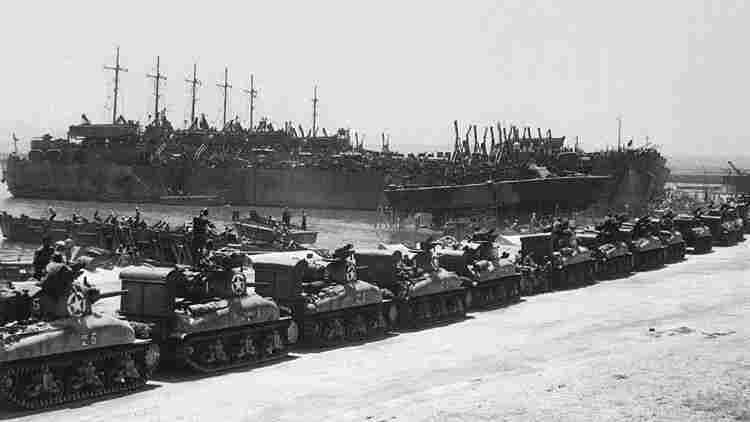 "Only an alert and knowledgeable citizenry can compel the proper meshing of the huge industrial and military machinery of defense with our peaceful methods and goals," Eisenhower said in his address. Eisenhower's message was spot-on, but came too late, says Andrew Bacevich, a retired career officer in the U.S. Army and professor of history and international relations at Boston University. "I think we should view the speech as an admission of failure on the president's part," Bacevich tells Raz, "an acknowledgment that he was unable to curb tendencies that he had recognized, from the very outset of his presidency, were problematic." During Eisenhower's presidency, defense spending accounted for 10 percent of gross domestic product, almost double today's percentage. But for Eisenhower to pull out the scissors and make cuts to the defense budget would have been declared anathema; the nation was prospering. "In the 1950s, a guns-and-butter recipe seemingly had worked," Bacevich says. "We were safe and we were prosperous, so what was not to like?" That's not the case today, he says. "We can no longer insist on having both guns and butter," Bacevich says. "We are compromising the possibility of sustaining genuine prosperity at home." As Eisenhower warned, "Every gun that is made, every warship launched, every rocket fired, signifies in the final sense, a theft. The cost of one modern, heavy bomber is this: a modern, brick school in more than 30 cities." Just as Eisenhower had trouble convincing Congress to re-examine the role of the U.S. military five decades ago, Bacevich says America's leadership has similar difficulties today. "Our political institutions demonstrate an unwillingness, or an inability, to really take on the big questions," Bacevich says. "And the American people – many of them distracted by all kinds of concerns, like having a job when there's almost 10-percent unemployment -- aren't paying attention." Bacevich insists that its time for Americans to review the belief that the United States needs to maintain a global military presence to safeguard national security. "There was a time, I think, in the Eisenhower era, military presence abroad was useful," he says. No longer. "Maintaining U.S. military forces in the so-called 'Greater Middle East' doesn't contribute to stability -- it contributes to instability," Bacevich says. "It increases anti-Americanism. So why persist in the belief that maintaining all these U.S. forces scattered around the globe are necessary?" If Americans could challenge that assumption, Bacevich says, then maybe it would be possible to have "a different and more modest national security posture that will be more affordable -- and still keep the country safe."